Dermal Fibroblasts - Cultured and cryopreserved Cynomolgus Fibroblasts from PRIMACYT. Compared to other fibroblast cell types, dermal fibroblast cells show only weak affinity to change into other cell types. Fibroblast proliferation can be stimulated by the presence of fibroblast growth factor (FGF). Cynomolgus Monkey Fibroblasts are cryopreserved in passage 1. Each vial contains at least 500,000 viable cells. 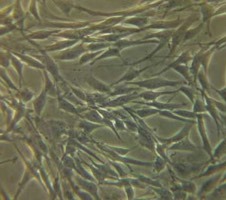 After thawing these cells can be cultured and expanded in FGM (Fibroblast Growth Medium). We do not recommend repeatedly thawing and freezing. Primacyt delivers Cynomolgus Monkey Fibroblasts on dry ice. After arrival at customer’s site, they need to be transfered for storage below -130°C until they are requested for experimental use. Live cell shipment is also available on request. Cynomolgus monkeys are tested for Simian Herpes B Virus, STLV (Simian T Cell Leukemia Virus), SIV, Simian Retrovirus and Ebola Virus, Salmonella, Shigella and Yersinia. Fibroblasts are tested for and are negative for bacteria, yeast, fungi and mycoplasma. Cynomolgus Monkey Primary Dermal Fibroblasts from Primacyt are available only for laboratory research. Products are explicitly not for human use, in vitro diagnostics or for therapeutic procedures. Transfer or resale of any Primacyt’s cells or products from customer for other purposes or to organizations or individuals is not allowed by Primacyt. Customer complies with adequate safety procedures for fibroblast products. Despite Cynomolgus monkey dermal fibroblasts are isolated from normal monkey tissue, customer is requested to treat such cells with caution, as the presence of pathogens cannot be excluded because all test procedure cannot completely assure the absence of infectious agents. Product Code NCDF. PRIMACYT Normal Cynomolgus Dermal Fibroblasts - Lot and Order Information. Cynomolgus Monkey Dermal Fibroblasts are available as cryopreserved cells. For ordering, please check for the lot number. Notes: You can search for this page by the terms fibroblast or fibroblasts, fibroblast cells, cultured fibroblasts, macaca, fibroblast definition, primary fibroblasts, cynomolgus dermal fibroblasts, cynomolgus dermal fibroblasts, cynomolgus fibroblast cells and cynomolgus fibroblast culture / fibroblast cultures or macaque. What are fibroblasts? Ask us also for basic fibroblast growth factor bfgf.